If you came here via a Google search looking for cutlery that can safely go into the microwave, these aren’t the cutlery you are looking for. The answer to that question is anything that has no metal at all, stick to plastic and wood. This microwaveable cutlery is called COZY Cutlery because it’s warmed by the microwave. 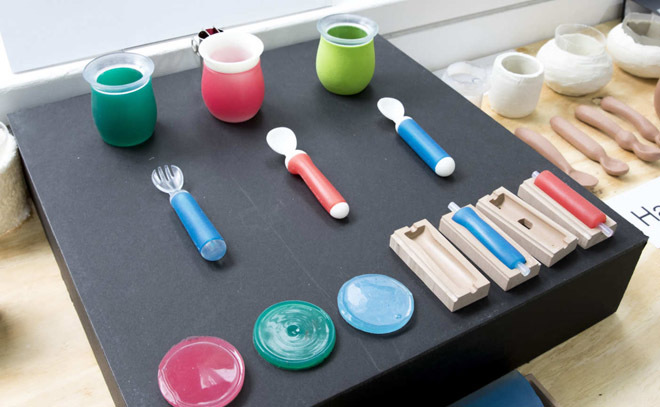 The concept is that having the flatware handles being warmed will make children eat slower and therefore healthier. OK, I think this is ridiculous and sounds like some mild form of torture. You can’t eat quickly because the handle of your spoon is too hot? Sorry, this is nonsense to me. Now, it is only a concept product created by Dyson School of Design Engineering. I’ll let you make your own mind up on this one. iSi Slim Silicone Spatula – Another Nutella Knife? The latest entry in the battle of Nutella spreaders is this iSi Slim Silicone Spatula. It has a thin sharp edges and is 1.5″ wide. The non-stick silicone is heat resistant up to 600 degrees and dishwasher safe. iSi had other sizes of this versatile piece of kitchen cutlery but this one seems to be just right for Nutella and the reviews are amazing. iSi Slim Silicone Spatula Best for Jars, Blender, and More. We’ve noticed a trend in “skinny” cutlery. Basically a long slender handled flatware seems to be the trend these days? And the Dragonfly 20-piece set by Fortessa is a good example of this. We haven’t looked at Fortessa before, they claim Fortessa tableware is used by over 70% of the Forbes Four and Five-Star Hotels in North America. This 20 piece set consists of 4 each: table fork, salad/dessert fork, table knife, dessert/soup spoon, coffee/tea spoon. Of course it’s made of dish washer safe 18/10 stainless steel. This is a truly full meal deal of cutlery that will cover all courses of a large meal. I really like the tiny fork and spoon! And a cute little trademark stamp on each of them. We here at The Cutlery Review have been talking about what we have named “Everyday Carry Cutlery” (ECC). The idea being that you have a handy portable and reusable set of flatware on your person in your backpack or purse. And if you check out the link you will see there are a lot of options out there. It’s handy, hygienic and good for the environment. Just say no to flimsy plastic forks. That’s a pretty strong statement that we can get behind. 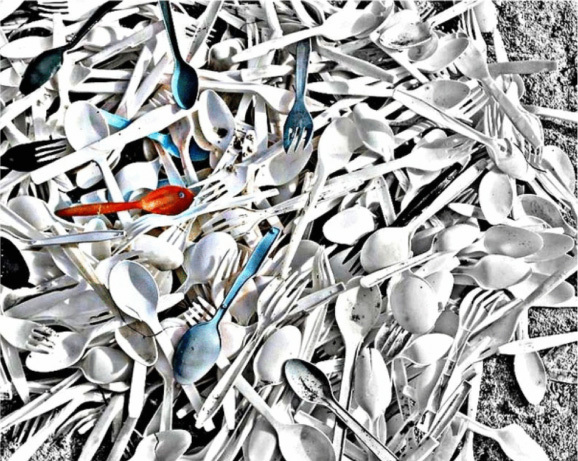 We are seeing plastic grocery bags being banned all over the world, why not plastic cutlery?